(Newser) – Opening his first White House Easter Egg Roll, President Donald Trump extolled the strength of America as thousands of kids, and some adults, reveled in the time-honored tradition of rolling hard-boiled eggs across the manicured lawn in his back yard. 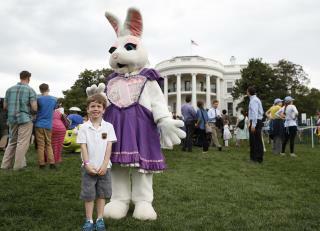 "This is the 139th Easter Egg Roll. Think of it, 139," Trump said Monday, welcoming families to the annual event, which the AP reports was dampened by intermittent rain. "And we will be stronger and bigger and better as a nation than ever before. We're right on track," he said, speaking of the nation's strength under fewer than 100 days of his leadership. Trump's wife, Melania, and their son, Barron, 11, and the Easter Bunny joined him on a balcony overlooking the expansive lawn before they went downstairs to join some of the 21,000 people who were expected to attend what is the biggest social event every year at the White House.